Recommended in Country Life magazine! 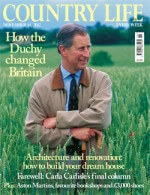 Parsons Joinery > Listed buildings > Recommended in Country Life magazine! Our ‘good reputation’ is highlighted in a recent edition of Country Life magazine (dated November 14th) for those seeking expert help in restoring or replacing windows on listed buildings.